Are you getting the most out of your chamber membership? Are you thinking of becoming a chamber member, but unsure of the benefits we have to offer? 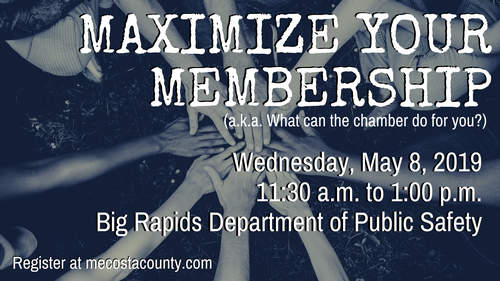 Do you want to become more active with the Mecosta County Area Chamber of Commerce, but don't know how? If you are looking for answers to any of these questions or if you have others about MCACC, then this is the class for you! During this free event, you will learn how to take advantage of all that the Chamber has to offer you and more. Topics will include: member benefits and which ones are right for your business, community engagement. committees, staff assistance, educational opportunities, Member to Member discounts, how to grow your professional network, marketing opportunities, potential partnerships, chamber website and more.